Routie 2.9 with Health integration and Voice coaching is here! | Glimsoft Routie 2.9 with Health integration and Voice coaching is here! 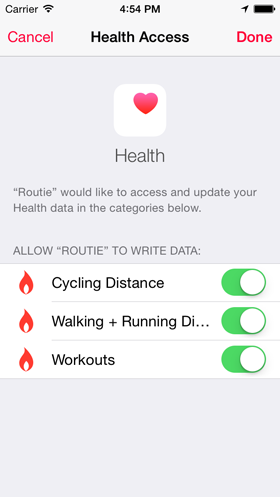 Routie 2.9 with Health integration and Voice coaching is here! For the past two and a half weeks, I’ve been hard at work on a new update of Routie. It brings two major new features, as well as one little surprise that you’ll discover moments after you get the update. Users have been asking for these two for quite some time, so I am really pleased to announce that the update is available on the App Store as of now! 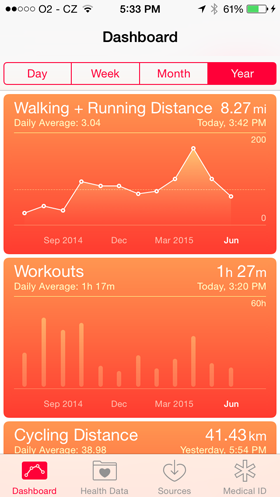 It gives you the possibility to see graphs of your workouts and let other apps access the data. In addition, you can choose to have all your historical tracks imported as well, so you won’t miss out on having these in Health neither. 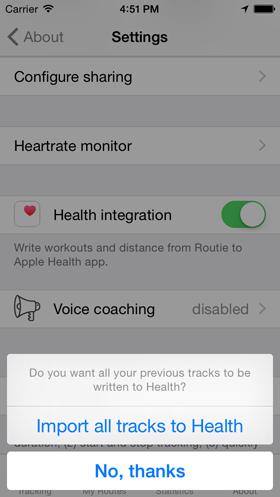 You can enable Health integration in Settings (accessible from About tab). This has been a longly requested feature and I am glad I finally decided and made the time to make it a reality. In case you are wondering, what this does is that it will inform you about your workout progress in specified intervals via speech. This is great if you need just timely info and can’t afford to pull your phone out of your pocket. For example, I tested it during a cycling trip and it was actually quite interesting experience. 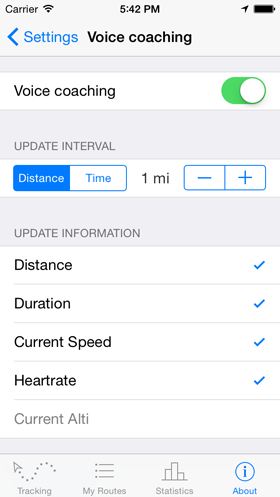 You can also hit the ‘Play sample’ button to hear a sample update to get a sense of what will be played during your workout. One interesting thing (as you can see in the list above) is that when you have a HR monitor connected, it will inform you about your heart rate as well. Same as with Health integration, you can enable Voice coaching under About tab -> Settings. This update took once again a bit more time than I expected, but I am glad I finished everything to the point of polish that I am used to. Apart from these two main new features, I’ve also fixed sharing to Facebook that was broken due to recent changes in Facebook platform, and I’ve also updated to their latest SDK so it should hopefuly be ok for a while. You can download the update here. And if you like it, then please write a review on the App Store. It really helps a lot! Thank you.